Once upon a time there was a person who could not understand as to why so many devotees queued up in front of the Shiva temple for darshan of the Shiv-ling. In fact he was extremely intrigued by the simplicity of these devotees, and so he wanted to see for himself, the power that Lord Shiva in his own Shiv-ling. So, one day he decided, here on, every night, when the temple is closed to the devotees, he would enter it from the back gate with his cane to whack the Shiv-ling at least five times, and see how Lord Shiva retaliates at him in return, as he was doubtful, even of his existence. And he confided in his wife about his agnostic idea, to take her reaction as she too was an ardent devotee of Lord Shiva. On hearing this, his wife shuddered, at the very thought. She tried to convince her husband tooth and nail, about the devastating consequences, but failed in doing so. The person started visiting the temple every night to whack the Shiv-ling. And every day in the morning his wife used to seek pardon in the same temple for him. 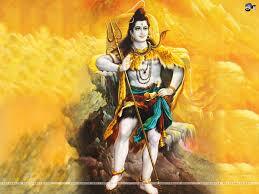 And gradually the person’s dare increased manifold when besides whacking he also started abusing Lord Shiva. But he was extremely regular in doing so. By now a year had passed, but he had not missed a single day where he did not whack the Shiv-ling. Whether, it was the heat of summers, freezing cold of winters or even torrential monsoon, and even when he was unwell or his wife or children were unwell he made it a point to enter the temple and whack Lord Shiva. Once, during monsoon, when it had been raining for a couple of days continuously, and the area around the temple was totally flooded, and the temple marooned. One could only swim to the temple, but that also was quite risky as all the snakes and crabs had come out of their holes and were floating along the waters. But the person was determined as ever to reach the temple. So he took the cane between his teeth and started swimming. And on the way he ducked and even went around certain snakes and insects and finally reached the steps of the temple. 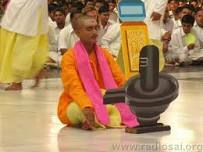 And happy at his effort, he as usual, entered the temple and started whacking and abusing Lord Shiva’s Shiv-ling. And he was enjoying it even more today because of the humungous effort he had put in to reach there. And then suddenly the person saw he was being blinded by a very bright light and saw some silhouettes emerging that resembled the pictures of Lord Shiva that he had often seen. ‘I’m impressed by your passion and regularity, even when each day, you only came to whack and abuse me. Not one day you missed out, no matter what issues you had at hand. I’m happy and I grant you a vardan, bhakt.’ Resonated, the divine loud voice of Lord Shiva as the silhouettes merged into a gigantic image of the Lord. The person was astounded when he realised his mistake and fell at the feet of the Lord and started asking for mercy. Lord Shiva granted him mercy and just then the gigantic image of the Lord started receding along with the bright light and soon everything was calm and normal. The story conveys a message that there is no shortcut for perseverance. Perseverance is so powerful that it even made Lord Shiva appear, even when the person was pursuing a campaign against Lord God Shiva. This story was told to me by my mother.